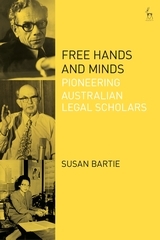 Peter Brett (1918-1975), Alice Erh-Soon Tay (1934-2004) and Geoffrey Sawer (1910-1996) are key, yet largely overlooked, members of Australia's first community of legal scholars. This book is a critical study of how their ideas and endeavours contributed to Australia's discipline of law and the first Australian legal theories. It examines how three marginal figures-a Jewish man (Brett), a Chinese woman (Tay), and a war orphan (Sawer)-rose to prominence during a transformative period for Australian legal education and scholarship. Drawing on in-depth interviews with former colleagues and students, extensive archival research, and an appraisal of their contributions to scholarship and teaching, this book explores the three professors' international networks and broader social and historical milieux. Their pivotal leadership roles in law departments at the University of Melbourne, University of Sydney, and the Australian National University are also critically assessed. Deftly ranging from local experiences and the concerns of a nascent Australian legal academy to the complex transnational phenomena of legal scholarship and theory, it makes a compelling case for contextualising law and legal culture within society. At a time of renewed crisis in legal education and research in the common law world, it also offers a vivid, nuanced and critical account of the enduring liberal foundations of Australia's discipline of law. Susan Bartie is Lecturer in Law at the University of Tasmania, Australia.